Save an extra CDN$ 2.92 (37%). Buy the Kindle Edition instead. Abigail Adams was a strong woman far ahead of her time. She urged her husband, President John Adams, to "remember the ladies" and despite having no formal education herself, she later advocated for equal education in public schools for both boys and girls. She was also the first First Lady to live in the White House! This biography tells the story of Abigail Adams and her role in America's Revolutionary War period. 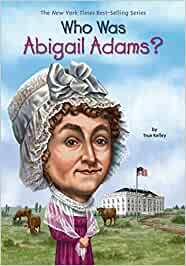 Start reading Who Was Abigail Adams? (Who Was?) on your Kindle in under a minute. True Kelley is the author-illustrator of Who Was Pablo Picasso? and the author of Who Was Roald Dahl? On June 17, 1775, at 3:00 a.m., Abigail Adams woke up with a start. Her bed was shaking. The dull boom of cannons ten miles away in Boston shook the whole house. The British and the American colonists were at war. Abigail had almost gotten used to hearing the boom from cannons every day as the armies fought. But this time was different. The cannon fire went on and on and on. I bought this book and 3 others for my granddaughter's 9th birthday. When I asked her what she would like for her birthday, she replied books - biographies and something on the Revolutionary War Era. This and the other books filled the bill. My 7 years old daughter view: Good details to know about Abigail Adams. She loves the part when Abigail Adams went to Paris to live together with her husband and son. Thank you to True Kelly to put together the nice details about her and her family. God bless!! Great book tells how hard times were than.